experiments were performed with A. cervicornis. Coral health was estimated visually and indirectly using a PAM underwater fluorometer to assess algae deterioration by the pathogen. Results showed higher photosynthetic activity for corals treated with both the pathogen and commensal compared to controls treated with the pathogen only. Studies such as these will help our understanding of coral microbial dynamics in response to environmental changes.Summary: Coral beneficial bacteria are known to protect their host against bacterial pathogen responsible for coral diseases. 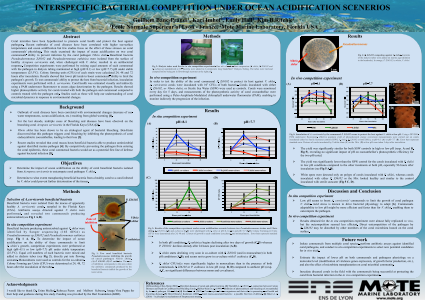 This poster gives the results of a study examining the impact of ocean acidification on the ability of coral commensals to compete with Vibrio shiloi, the causative agent of bleaching.References: Rosenberg et Ben-Haim (2002) – Microbial diseases of corals and global warming. Biomass and Death in Caribbean Reef-Building Corals. Ben-Haim et al. (1999) – Inhibition of photosynthesis and bleaching of zooxanthellae by the coral pathogen Vibrio shiloi. Krediet et al. (2013) – Coral-asspciated micro-organisms and their roles in promoting coral health and thwarting diseases. Shnit-Orland et Kushmaro (2009) – Coral mucus-associated bacteria : a possible first line of defense.